Well, we start off with level 2-16! In this level, you will notice that you have three birds. All three of those birds are Han Solo. 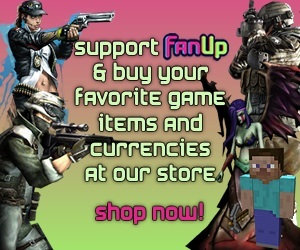 Your goal is to destroy seven enemies. Six of those enemies are Oink Commanders. The last enemy is a big, fat and red-mustached Pig Leader. There are a bunch of triangles that are covered with metal blocks. I have a feeling that the metal blocks are used for deflecting the blaster bullets from Han Solo! Let's get to it and find out! To beat this level, you need to send Han Solo towards the top Oink Commander. Once you are near him, you much shoot the blaster. Bam bam bam! The blaster bullets should deflect off of multiple metal bars. Ultimately, this will make the TNT block blow up. The block will fly and hit the last Oink Commander. All of them will be destroyed with one of the Han Solos. Using this technique, I got a score of 64,890 points. That was enough to get me three stars for Death Star. Although I got that score, you only need a minimum of 62,000 points. This level was not that hard to beat and I hope that you will have a successful time as I did. Next we go to 2-17. In this level, you are given three birds. One of those birds is Han Solo. The other two of the birds are Obi-Wan Kenobi. Your objective is to destroy eleven enemies. Seven of those enemies are Pigs with Hats. Three of the enemies are Oink Commanders. The last enemy is a big, fat, and red-mustached Pig Leader. No, there are two Pigs with Hats hanging from the ceiling. If you go father back, there is a glass ledge. On the glass ledge are the three Oink Commanders. Under them is a Pig with a Hat. Between the two Pigs with Hats hanging from a ceiling, you see four pigs with Hats underneath them. In a little barricade is the big, fat, and red-mustached Pig Leader. 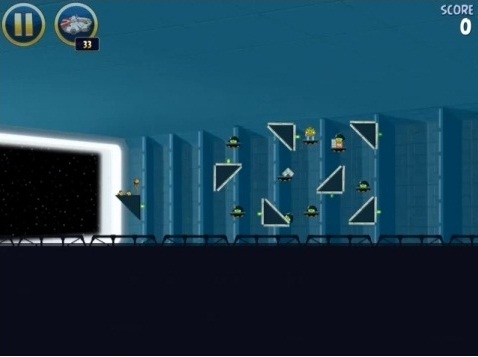 To beat level 2-17 you must launch Han Solo towards the the ceiling Pigs with Hats. Use the blaster and it should deflect off some metal blocks and destroy multiple enemies. Then launch Obi-Wan Kenobi right into the pile of rubble and use the force. All of these metal and wooden blocks will go flying and give you the win because they were destroyed. Using this technique, I got a score of 86,060 points. You only need a minimum of 84,000 points. This was not that hard of a level actually. This was pretty darn easy! Lastly, we are on to level 2-18. In this level, you are given three birds. One of the birds is Han Solo. 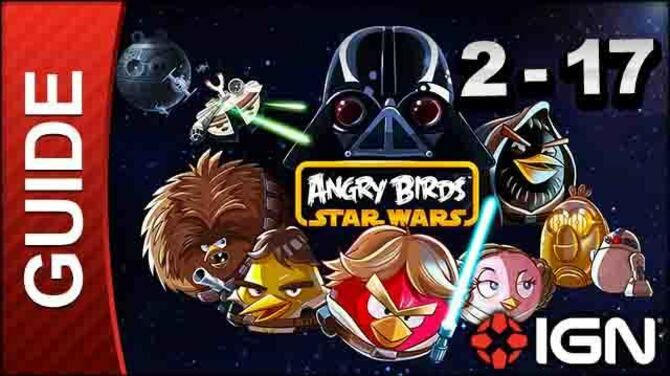 The other two birds are Obi-Wan Kenobi. Your objecive is to destroy six enemies. Three of the enemies are Oink Commanders and the other three are pigs with hats. There are two Oink Commanders sitting on top of some metal bars and the other Oink Commander is dangling by a rope. The three Pigs with Hats are hiding by all the rubble. This is kind of a spaced out level. It will be an interesting one to beat! 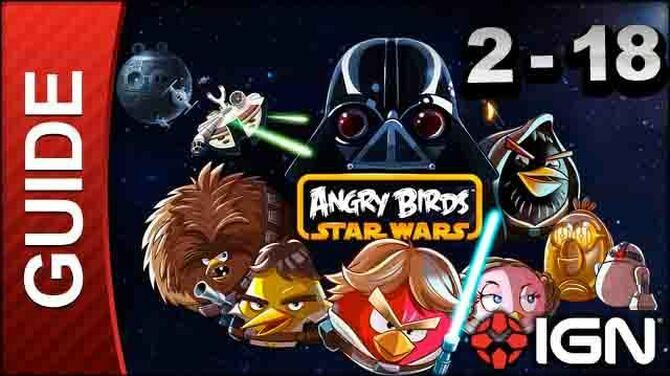 To beat this level, you must send Han Solo into the battle and launch the bullets at the dangling Oink Commander. The wheel will fall and crush the boards. Now, these things will start to move. It's like a trash compacter. It ends up crushing the Pig with hats until they are 100% destroyed!! using this technique, I got a score of 66,700 points. The minimum needed for three stars is 66,000. So, I barely beat the level. I had a harder time on this level. I hope you do better than me, but still this strategy is really good and I would recommend you to use it. But wait.. We aren't done yet! We can get the Golden Droid! Go back to level 2-18 and you'll see a Golden Droid. First of all, I actually missed a Golden Droid on Tatooine Level 31. Let's quickly go over that. Launch one Obi-Wan Kenobi over into the meteor rock pile and send another Obi-Wan Kenobi to push a rock towards the Golden Droid. Send R2-D2 into the battle and he will carry the things down with him. All the Pig Troopers will be destroyed by gravity. Using this technique, I got a score of 43,440 points. You only needed 43,000 points for three stars though. Well back to the 4th Golden Droid. Once you send Han Solo backwards and below the area, count to 2. Shoot just under the Golden Droid and you will be able to get it and go to the bonus level. Anyways, to beat the bonus level you must send the golden thing into battle right in the middle. Blow it up and kill the Pig with hats. Then use R2-D2 and send him in the middle and use the eletrical. Then the level will finish by itself. The TNT will blow and the shooter pigs will destroy everyone else including themselves. The score I got was 92,880. You only need a minimum score of 91,000 points to get three stars. Well, sorry for the ultra long guide. I kind of forgot to put the level 3 in a long time ago. 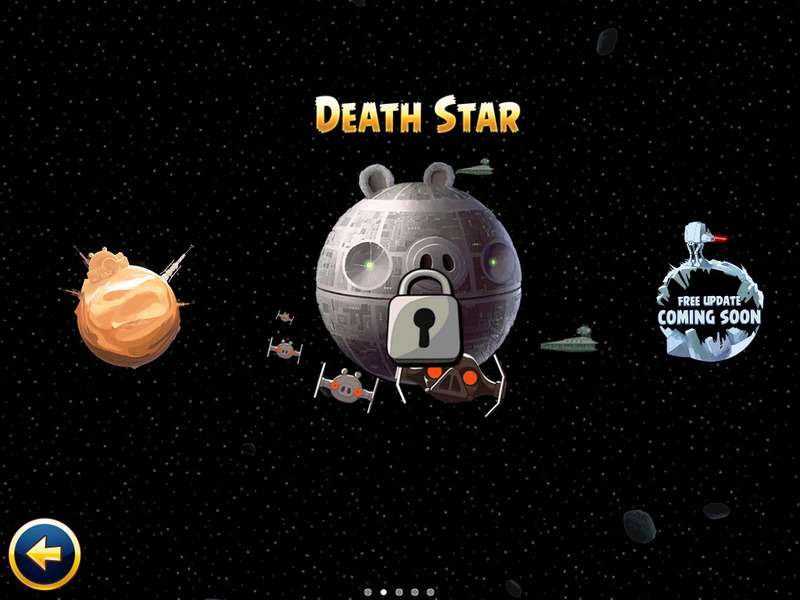 Anyways, you should have 54/120 stars for the Death Star and 12/45 for the Bonus world. This means you are 45% done with Death Star and 26.6% done with the Bonus world. I sure hope this helped you. This is spm8675309!